April's book selection is Twinmaker by Sean Williams. Email Amy, events@redballoonbookshop.com, with questions and to sign up. The NYM-ACTUAL-BOOK CLUB (ages 14+) will discuss Twinmaker by Sean Williams. Sean Williams , The Force Unleashed. Sean Williams will be making his only West Coast appearance in Malibu for the launch of Star Wars: The Force Unleashed! Based on the new & exciting LucasArts video game, and the story by Haden Blackman, this new Williams novel is the latest must-have for Star Wars fans ... and, really, who isn't&quest;! 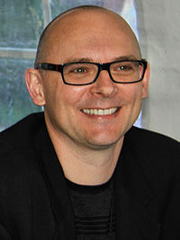 Williams is the award-winning author of more than sixty short stories and eighteen novels, including Star Wars New Jedi Order Force Heretic novels, co-written with Shane Dix. With a special appearance by: The 501st Legion! This amazing group was founded in 1997, and has spread its Star Wars magic through the authentic-looking costumes and attention to detail. They've made appearance for charity organizations like the Make-a-Wish Foundation, and they've even appeared with George Lucas himself! Sean Williams's book Hope was available from LibraryThing Early Reviewers. Sean Williams is currently considered a "single author." If one or more works are by a distinct, homonymous authors, go ahead and split the author. Sean Williams is composed of 3 names. You can examine and separate out names.